My favorite 15 places to visit in Tennessee list wouldn't be complete without these points of interest. I have to tell you that narrowing the list down to 15 is a real challenge. It's not hard to find a place to stay near these spots. There are usually plenty of hotels and motels nearby that can help. I cheated under some headings to sneak in another point or two. Sure hope you don't mind. If you do too bad. This is my home state and I love it. Here's why. The Norris Dam State Park in Tennessee has lots to offer. There are campgrounds, picnic areas and places to hike. Of course, the main attraction is Norris Dam. When the spillways open at the top of the dam it is a sight to behold. No photo can do justice to the raw power being expelled. This makes it one of the top 15 things to see in Tennessee. 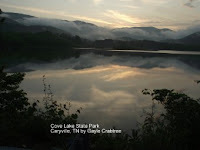 There are two more places near Norris Dam that are among my top 15 things to see in Tennessee. The Museum of Appalachia keeps the history of the Appalachian Mountains alive. The annual fall homecoming draws people in from all over the country. Did you know that meade is an alcoholic drink that's made from honey? I didn't. This unique spot should be on everyone's list of places to see in Tennessee. Go in and try a sample. It's just down the road from Norris Dam. Travelers who stay at any of the hotels at I-75 Clinton exit 122 can easily drive to any of the locations listed above. Who needs a hotel when you can rent a cabin or campsite? This park has both plus a swimming pool, playgrounds, lakefront walking trail, hiking opportunities and a picnic area. It probably also has several amenities that I forgot. It's in Caryville just off of I-75 exit 394. Nashville Tennessee isn't just the country music capitol of the world it's home to a replica of the Parthenon and Athena statue. It took three months just to plate the statue with sheets of gold. Other displays make this one of the things to see in Tennessee that the whole family will enjoy. Stay in a nearby hotel to visit other Nashville sites. This attraction goes without saying. If you're in Memphis you have to stop by Graceland. An admission fee is charged. There are tons of hotels and motels in the city. The short answer of things to see in Tennessee around this city is yes. I always enjoy the Tennessee Aquarium, arts district, civil war history, shopping, Children's Discovery Museum. Plus, many of the attractions are cheap or free. Hotels are near many of the these attractions. This city should be on your list of 15 things to see in Tennessee. Find a canon like this on Lookout Mtn. in Chattanooga.